We’re running out of food. In about 30 years, the world will have more people than our farms can support. Right now we could feed everyone—if we could distribute all of the food we have. But that won’t be true by 2050, according to the Global Harvest Initiative and other sources. We can’t farm much more land. Clearing more trees and plants to make way for farmland would be a disaster for air quality and for our environment. So, how do we make more food? We have to find a way to harvest more food from our farmland. We have to help farmers increase their yields—the amount of food they harvest from every square meter of land. Farmers like that idea, too. But it’s already been tried. For decades, some farmers have used chemical fertilizers to increase their yields. But these chemicals have limits and side effects. Another alternative is to farm with greater precision, in terms of crop management and timing. Farmers can achieve greater precision if they invest in the power of technology. But that’s already been tried, too. To harvest at the right time and get the best yields, many farmers have already invested in technology that helps them watch their crops—drones, sophisticated sensors and other new devices. These tools help farmers track weather, growth patterns and other factors. By weighing this insight against the constant fluctuation of crop market prices, farmers can more accurately calculate the best time to harvest and sell. Selling at the right time can mean a gain of tens of thousands of dollars. This new technology is where I interact with agriculture. I am not a farmer nor an agriculturalist who studies farming. I’m the chief technology officer at Drotek, a French startup that engineers and sells hardware and software for autonomous vehicles, global positioning systems and Internet of Things (IoT) sensors. I am fascinated by how precisely we can track and measure position, temperature, humidity and other agricultural factors with even the smallest devices. At Drotek, we are constantly finding ways to extract more information and greater precision from tracking devices. Farmers are overwhelmed by data, and they have limited time to analyze it. They need to work in the field, while a system tracks trends and predicts prices like an automatic investment banker. With input from field sensors and drones, together with live updates and prices from agricultural markets, a software solution could weigh a range of factors to tell a farmer exactly when to harvest. I don’t want to say that’s already been tried, but it’s not exactly a new concept. Many modern farms are multimillion-dollar businesses with advanced systems that do help monitor crops and increase yields. So how can we grow more food? How can our farms feed our future population? I think the answer lies within “Agriculture 2.0”. 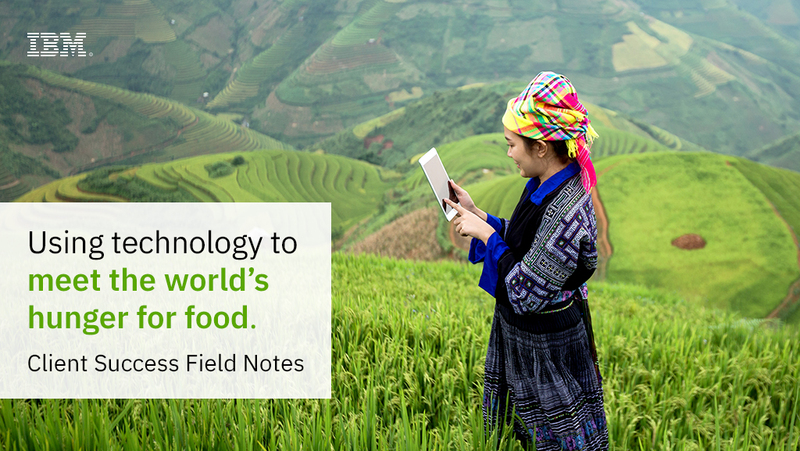 There is a fundamental shift in the approach to agriculture around the world, and it takes precision farming to the next level. Current systems have two important limitations. First, they do not have the capacity to consider all the data we can gather. The systems are designed to factor in a limited number of devices and sensors. Second, the systems cannot learn. They are programmed to consider set parameters, so they can only give farmers advice based on the general and deterministic rules that were understood when the software was developed. IBM Watson® Machine Learning can adapt to consider new parameters, uncovering correlations that hadn’t been seen before. And because farmers already work in a world of too many parameters, it’s also essential that cognitive systems can help identify what information actually matters. We don’t have to limit the system up front—we simply feed it the data and let it decide. Cloud-based services also help a cognitive system learn from results all around the world, so that each season brings greater knowledge, finer precision and better yields for everyone. Another benefit to a cloud-based solution is that results arrive in real time, so farmers receive the right information at the right moment. I’m anxious to see what cognitive technology and open-source innovation will do with real-time feedback from the most advanced sensor technology. We are already analyzing factors like temperature, humidity, light, air pressure, soil pH, precipitation, groundwater and wind to help predict plant strength, suggest irrigation timing and more. These insights were not possible with preprogrammed systems. So, the challenge is that we need to make the most of them. We must turn information into proven results and proven results into knowledge. Because we need knowledge to feed our future. For more, watch the IBM interview with Kevin Lopez Alvarez below.